It's summer, the sun hasn't made much of an appearance but we all want a golden glow! My legs are so pale and the sun doesn't stay out long enough for me to get a natural tan. I'm not a huge fake tan fan, I usually opt for a gradual tanner but I have never found 'the one' that I would buy religiously....until now. Skinny Tan is a new brand to me and I am so glad I was asked to test this product out! 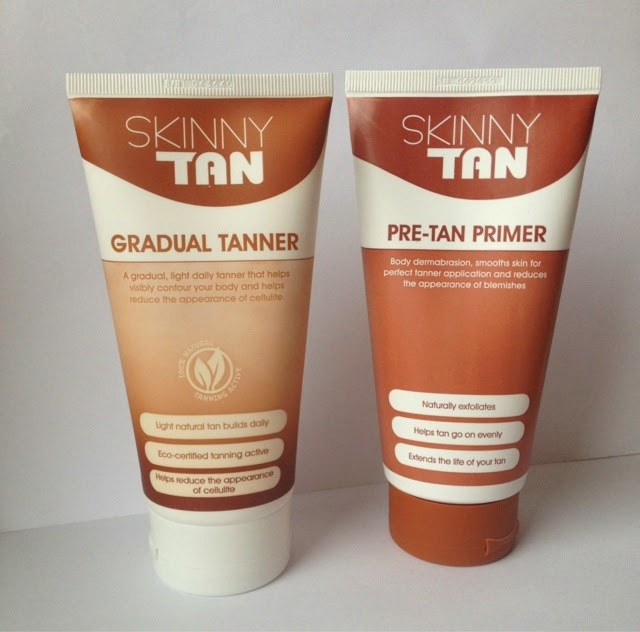 *Skinny Tan Gradual Tanner RRP £19.99 & *Pre-Tan Primer RRP £14.99. "Direct from the golden beaches of Bondi Australia, Skinny Tan is a salon-quality, self-tanner that instantly bronzes the skin then develops into a deep gorgeous golden brown that lasts for up to 7 days! 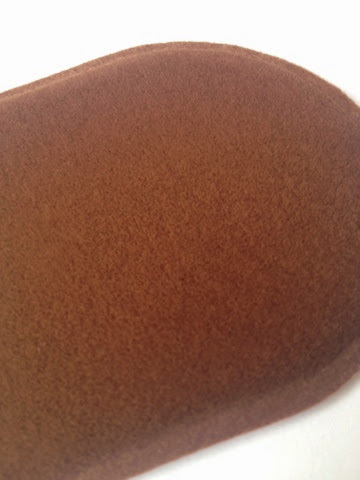 Skinny Tan have perfected a colour so natural it is indistinguishable from a real tan PLUS because it is made with the highest quality naturally derived tanning actives Skinny Tan won’t irritate or dry your skin and it doesn’t have that awful fishy fake tan smell! Instead Skinny Tan smells like a coconut island breeze. 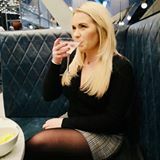 But best of all this easy-to-apply, long lasting tanner also helps firm and visibly smooth as it tans to help reduce the appearance of cellulite." I was kindly sent these products to test out. 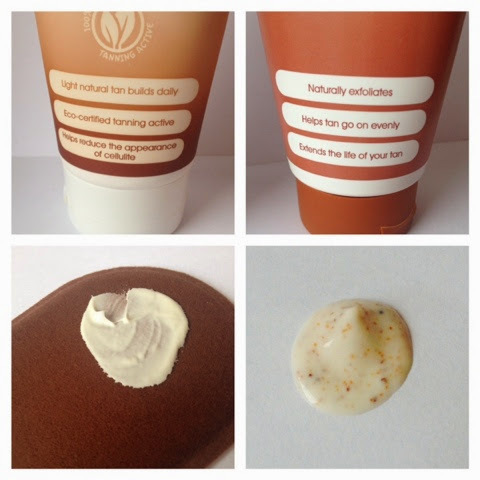 I started my routine by using the Pre-Tan Primer which is lovely, packed full of exfoliating beads to buff away dry skin and leaving your skin smooth and soft ready to apply the gradual tan. 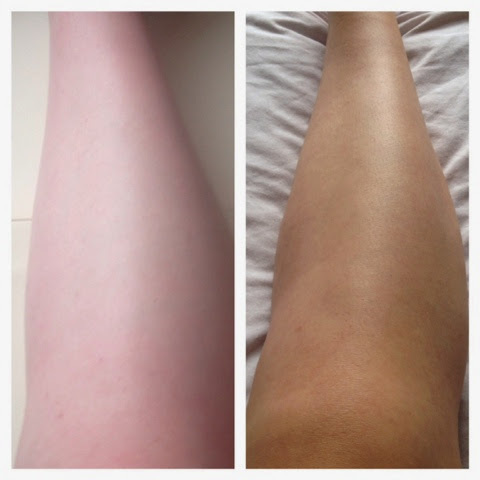 Left - Gradual Tan - Right - Pre-Tan Primer. After using the Pre-Tan Primer I opened the tanning mitt (which is THE softest velvety texture), and applied the gradual tan directly to the mitt, I immediately noticed you really don't need a lot of product to cover your whole leg and the mitt applies the product extremely evenly. I was really surprised how quickly the product soaked in to my skin, no standing around half naked for hours waiting for it to dry. Skinny Tan recommend applying this then leaving it on for up to 8 hours before showering to get the full bronzed effect. These pictures don't do the product justice but believe me it's well worth it! I am really impressed and very grateful I got to try this product out. I will definitely repurchase when I run out! Never heard about this product, the results look really good though!! I've never heard of this brand before but it looks like one I should definitely try out! The results look amazing! Might have to give it a go, I use the moisturiser tan usually.